On this date in 1939 in Nazi-occupied Poland, newly appointed Governor-Gen­er­al Hans Frank estab­lished the War­saw ghetto and began forcing the city’s Jews into a single area. Ten days later Frank and his deputy Arthur Seyss-Inquart ordered Jews in Poland to wear a white brace­let bearing a “Star of David.” Like Frank, Seyss-Inquart was an un­wa­vering anti-Semite and assisted Frank in the “paci­fi­cation” of Poland’s under­ground resis­tance move­ment, or Polish Under­ground State. Following the capit­u­la­tion of the Nether­lands, Bel­gium, and Luxem­bourg to the Ger­man Wehr­macht in May 1940, Seyss-Inquart as­sumed the office of Reichs­kom­mis­sar for the Occu­pied Nether­lands. With­in months of his arri­val, Seyss-Inquart banned all poli­ti­cal parties except the Dutch fas­cist party, the National Social­ist Move­ment in the Nether­lands (NSB), which op­er­ated a para­military wing. His ad­minis­tr­ation estab­lished a forced labor pro­gram that put around 530,000 Dutch civil­ians to work for the occu­piers, of whom 250,000 were sent to fac­tories in Ger­many. Camp Erika at Om­men (east­ern Nether­lands) col­lected Dutch­men who refused to per­form forced labor. An­swering directly to Adolf Hitler, Seyss-Inquart took mea­sures to remove Jews from the Dutch govern­ment, the press, and leading posi­tions in in­dus­try. Anti-Jewish mea­sures in­ten­si­fied from 1941: approx­i­mately 140,000 Jews were regis­tered, a ghetto behind barbed wire was created in Am­ster­dam, and several “Jewish as­sem­bly camps,” or tran­sit camps, were set up, one at Amers­foort in cen­tral Hol­land and one near West­er­bork in north­eastern Hol­land. Sub­se­quently, in Febru­ary 1941, 600 Jews were dis­patched to con­cen­tra­tion camps at Buchen­wald in Ger­many and Maut­hausen in Austria. Later, 101,000 Dutch Jews and about 5,000 Ger­man Jews (in­cluding Anne Frank and her family) were deported from West­er­bork to Au­schwitz-Bir­ke­nau (Oświęcim in pre­sent-day Poland), Sobibór (Poland), Bergen-Belsen (north­western Ger­many), and There­sien­stadt (Terezín, Czech Republic), where most died from depri­va­tions, ex­haus­tion, or dis­ease or were gassed. As Allied forces approached West­er­bork in Septem­ber 1944, the remaining Jews were re­moved to There­sien­stadt. Of 140,000 regis­tered Jews in Hol­land, only 30,000 sur­vived the war, many of them hidden by the Dutch underground. Left: Austrian lawyer Arthur Seyss-Inquart (1892–1946), shown here in Vienna in 1940, was a devo­tee of Hein­rich Himm­ler and his con­cepts of racial purity. In February 1938 Austrian Chan­cellor Kurt Schusch­nigg appointed Seyss-Inquart Minis­ter of the Interior after Adolf Hitler had threatened Schusch­nigg with mili­tary actions against his coun­try in the event of non-com­pli­ance. 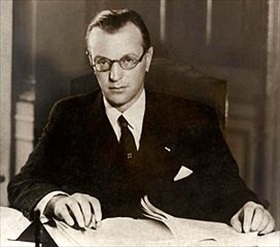 Following the inva­sion of Poland, Seyss-Inquart became a deputy to Governor-General Hans Frank. He fully sup­ported Frank’s heavy-handed policies, including the brutal persecution of Poland’s Jews. Right: In this photo Seyss-Inquart is seen addressing Ger­man Ordnungs­polizei (Order Police) in the Dutch capital, The Hague, 1940. The Ordnungs­polizei reported to Hein­rich Himm­ler, Reichs­fuehrer-SS and Chief of German Police. Following the capit­u­la­tion of the Low Coun­tries, Seyss-Inquart was appointed Reichs­kom­misar for the Occupied Nether­lands in May 1940. 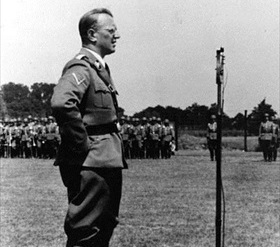 Until July 1944 Seyss-Inquart admin­i­stered the coun­try him­self. Up until Dutch libera­tion in May 1945, Seyss-Inquart autho­rized the exe­cu­tion of around 800 Dutch people (although some reports put this total at over 1,500), which included the repri­sal exe­cu­tions of 117 Dutch­men for the attack on an SS police chief. At the Nurem­berg Trials, the court weighed Seyss-Inquart’s involve­ment in the harsh sup­pres­sion of Nazi oppo­nents during his years in govern­ment ser­vice, atro­ci­ties per­pe­trated against the Jews, and his reign of ter­ror in the Nether­lands. He was found guilty of crimes against humanity and sentenced to death in 1946.